When Brad and Kate Mead approached David Defazio about their idea to make bourbon, he felt like he’d been called in to the principal’s office, as they looked at him solemnly. When they said they wanted to make bourbon, David’s first thought was, “How the heck do you make bourbon?!”. But then his investigative lawyer side kicked in, and he was off to Kentucky. What better place to start than the Kentucky Bourbon Festival and the birthplace of bourbon? Each year, the Kentucky Bourbon Festival is held in Bardstown. Thousands of visitors take tours to learn how bourbon is made, and for some, have their first taste of the good stuff. David and Brad went to Bardstown and talked with some folks from Heaven Hill (makers of Evan Williams, Rittenhouse Rye and more), who were helpful in pointing them in the right direction. Lincoln Henderson, the former master distiller of Woodford Reserve and more recently, master distiller of Angel’s Envy, also did a bit of consulting with David and Brad. Rob Sherman, of Vendome, made sure the new team of Wyoming Whiskey had the still they needed, when they needed it. The final piece to the puzzle was when they met Steve Nally, a master distiller with more than three decades of experience, including 15 years as master distiller at Maker’s Mark. But first – what were they going to make? They found an old moonshiner’s still in the yard of a friend’s father, that hadn’t been used in years and needed serious attention before they could use it. 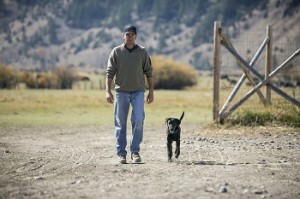 Once the still was up and running, Steve led the team in developing the mashbill for what would become Wyoming’s bourbon. Bourbon, by law, has to be at least 51% corn and aged in new, charred oak barrels. But contrary to what most people think, it doesn’t have to be made in Kentucky (but it does have to be made in the US). Ok – bourbon. That’s the what. On to the how to make it! Just like wine, craft spirits have terrior – the water, the ingredients, the weather – all affect the way the final product tastes. The water used in Wyoming Whiskey is from a limestone aquifer, located about 40 miles north of the distillery’s current location in Kirby. The grains are also locally sourced, which contribute to the unique flavors found in Wyoming Whiskey. Grain, good water, a good formula: all these things are required to make a craft spirit that people want to buy. But the main ingredient can’t be purchased from a farm or piped out of the ground: time to age in the barrel. I’ve read about various techniques to accelerate the aging process: smaller barrels, chopping up the barrels, all sorts of things. The Wyoming Whiskey team has been fortunate enough to have the financial support to wait while their bourbon ages as long as they feel it needs to. But don’t think they didn’t try a few experiments! A little thing called Boyle’s Law (as the liquid volume reduces, gas pressure increases) nearly caused the experimental barrels to explode. Not really what you’re looking for in your warehouse! So, back to the normal aging process, which for WW is more than four years before the bourbon is ready to be bottled. 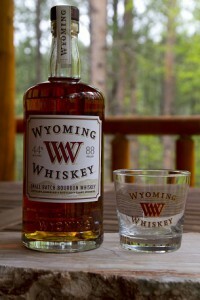 Fast forward to December 2012: the first time Wyoming Whiskey is sold to the public. The entire population of the state of Wyoming is a little over half a million people: a fraction of the size of most urban cities. The day that Wyoming Whiskey was ready to sell? More than 4,000 people came to Kirby – a town of 92 people! Quite a show of support for Wyoming’s first distillery. Online sales to retailers? 2,400 cases in 26 seconds! Wyoming Whiskey was off to a great start. That great start was the foundation that has continued, with expansion into neighboring states and new markets. I asked David what he thought was the strangest compliment he’s gotten on Wyoming Whiskey. A local businessman pointed out that the bourbon will be his legacy. Never having thought of it in those terms, it was both humbling and flattering to consider. I’d say given the careful thought and planning that’s gone into their bourbon, Wyoming Whiskey will be around for many years to come. But, some good things do come to an end. Back in 2007, when Steve Nally first signed on with Wyoming Whiskey (and moved to Kirby), everyone knew it wasn’t forever. He’d had a long and successful career already, and while he couldn’t resist the call of setting up a distillery his way, from the ground up – he now couldn’t resist another call. The call of his Kentucky home. While Steve will always be a part of the Wyoming Whiskey family, he’s stepping down from his daily duties to return home, leaving the distillery operations in the hands of a very capable team. I had the opportunity to meet their Distiller & Product Manager, Elizabeth Serage and National Sales Director, Tim Harland, during the ACDA Convention in Denver. Enthusiastic and knowledgeable, they both impressed me with their love of what they do. I also got a chance to try their juice – it’s an impressively smooth, light bourbon. Another craft spirit that has something for everyone – the whiskey newbie won’t find it overpowering, but the seasoned fan will find flavors and notes that won’t fail to win them over. Check out their site here – and if you’re in Wyoming, stop by for a tour – and tell them LikeYourLiquor sent you!